This is a detailed guide in selecting the right motor starter for your application. Let’s start with a quick brush up on the components of a motor starter. Assembled motor starters consist of a contactor, overload relay mounted in a NEMA 4X rated polycarbonate enclosure. You may refer to our detailed guide on selecting a contactor if you want to read up on contactors first. Or if you would like an overview on contactors and overloads and how they work you may refer to our guide on the basics of motor starters. For the purposes of pre-assembled starters, we’re only considering non-reversing contactors, and utilization categories AC-3 and AC-4. Refer to your motor or equipment nameplate to verify the Full Load Amperage (FLA) at the line power voltage you intend to provide. Choose a starter rated for current (Amps) higher than the FLA of your motor at the line power voltage you intend to use. Choose the control power used to close the contactor. If the line power will be used as the control power as well, wired directly to the contactor, this is referred to as a “direct-online starter”. If you would like remote start terminals and will be using different voltage for line power and control power, we refer to this as “separate control voltage + remote start terminals”. Reset button only gives you a Blue reset button on the enclosure cover to reset the overload relay if it is tripped. The reset button also functions as a local stop button. 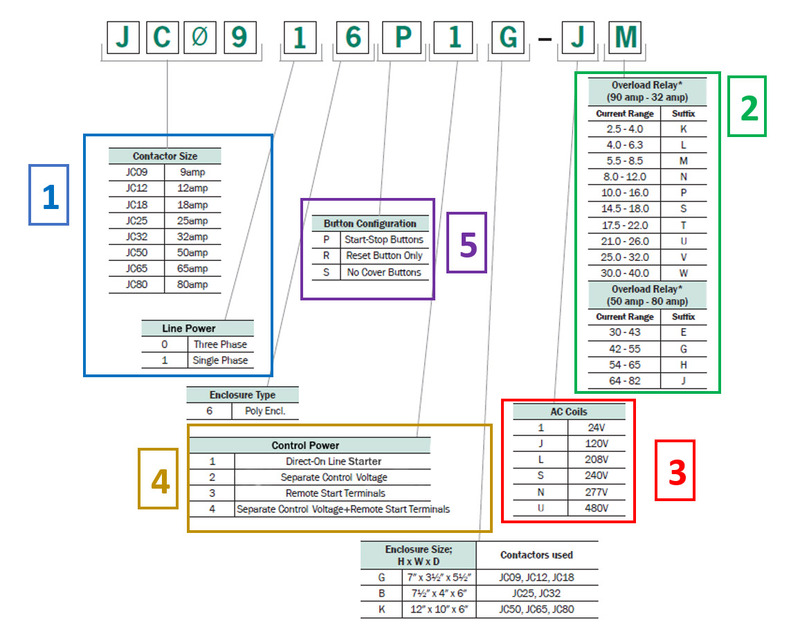 Download the PDF below for wiring diagrams for various configurations. If you are unsure, please feel free to contact us. We are happy to explain further or talk about custom options if you don’t see what you’re looking for.